Keynote presentation that you'll be using at today's board meeting. Now that it's finished, you decide to run through it one last time, just to be safe. So you fire up Keynote, and your heart sinks as you stare unbelieving at the message above. 1. After taking a few moments to calm down and avoid tossing your Mac out the window, you suddenly remember the Versions feature in Lion & Mountain Lion that automatically saves versions of your file as you work. 2. You jump into Finder, restore an older version, and... it doesn't work either. 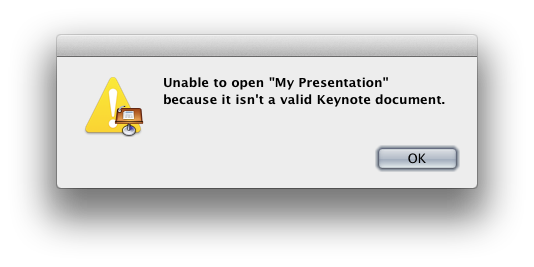 Keynote still tells you that the file is invalid. 3. Still Nothing: So you try another version, and another, but Keynote remains adamant that your attempts are futile, and now you begin to panic as the realization sets in that your presentation starts in 15 minutes and your work is gone. Step 1: Rename the file to a .zip file. Now that you've made a copy, you need to locate your file in Finder, highlight it, and then press the Enter key to rename the file. 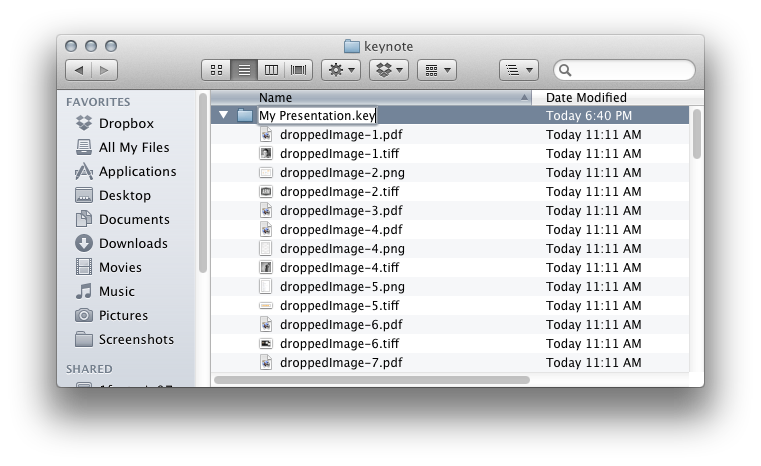 If the file name ends with .key, change it to .zip. Otherwise, just add .zip to the end of the filename, and press Enter again. When Finder asks, tell it to Use .zip. Step 2. Open the zip archive. At this point, if everything has gone well, you should be feeling somewhat relieved, as you can at least see that your work is not completely lost, just hidden. 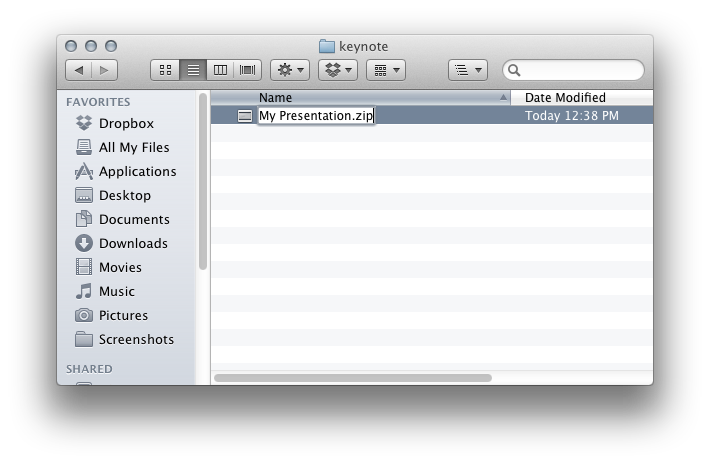 So, how do you get this back into Keynote, you might ask? No, you won't have to redo everything. Here's where you have to cross your fingers and hope for the best. 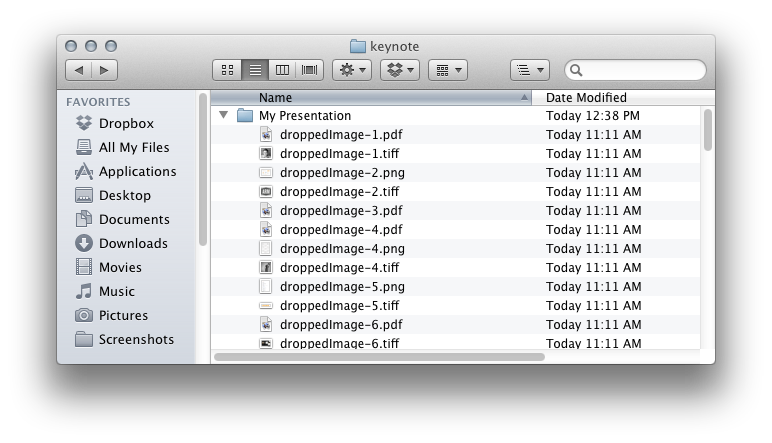 If all went well, you should be able to just double click on the file and Keynote should fire up with your presentation, in all of its glory. If it doesn't work, go back and double check that you didn't miss anything above. If you've checked and it's still not working, then sadly, there's a good chance that something really is wrong with the presentation. 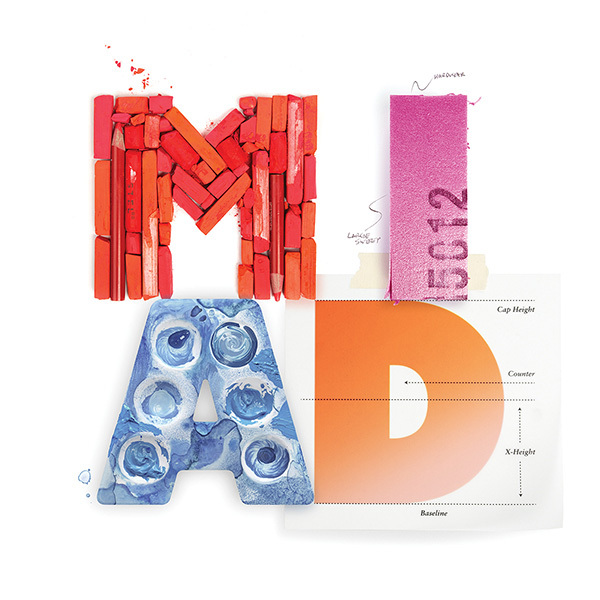 If this is the case, hopefully you still might be able to salvage some of your work out of the file by digging through the folder you get in step 2 and extracting the graphic assets. If it did work, congratulations! Now you can relax... after you go give your presentation, of course.